Mish's Global Economic Trend Analysis: Economics for Dummies: Reader Asks "Where Do I Start?" Economics for Dummies: Reader Asks "Where Do I Start?" Reader Brad writes: "Hi Mish. I am new to economics. I am not an investor. I have a high school education. I don't understand your blog. Where should I start? Thanks, Brad"
Thanks for trying to understand. By trying to learn, I suspect you already know way more than the average person. Here's some reading material that will help. The first three above are free downloads. Tomorrow's Gold is an investment book by Marc Faber, one of the best ever. I have read all of the above. 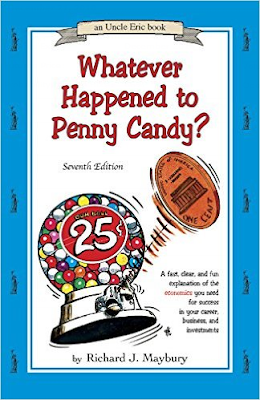 Here's one that I have not read but appears to be worth a read as well: Whatever Happened to Penny Candy? by Richard Maybury. Penny Candy came up in a search I did while posting the above books. I like the title, but more importantly I like this part of the description: "All explanations and interpretations are according to the Austrian and Monetarist schools of economic theory." The key word is "Austrian". Always let your economic thoughts be guided by Austrian theory and your actions by Libertarian principles. I have read that book, and I meant for it to be in my list. It's now added above.